Looks: Nice, airy, fluffy buds. Almost entirely white with crystals, with lots of thin orange frizzy hair. Smell: Dank and earthy. 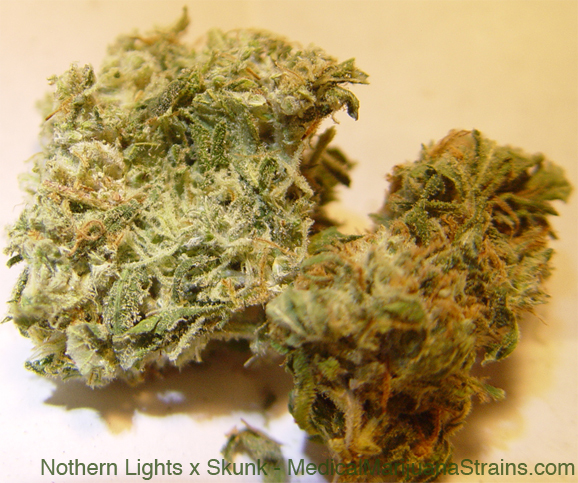 No sweetness or fruitiness in the scent, like you may expect from a skunk blend. Taste: The flavor, contrary to the scent, is very sweet with slight earthy undertones. The smoke/vapor is heavy and thick, and seems to expand in your lungs. Effects: This is a physically fuzzy high, I feel kind of like a teddy bear. Fairly clear minded, and not necessarily hard to focus, but very easily distracted. Physical reaction time slightly slowed, but mainly due to muscle relaxation than to slower mental faculties. It is definitely a bit floaty. Potency: Effects lasted 1.5 – 2 Hours. Notes: Definite bodily pain relief qualities, accompanied by appetite stimulation.